Katsura Beach (桂浜) is one of the popular beaches located in Kochi. It faces Pacific Ocean and has a great scenic beauty. It was considered as the best Luna view spot in Japan. There is a statue of Sakamoto Ryoma who is one of the most popular Hero in Japan. Also, there are Aquarium and Sakamo Ryoma Museum. Around the parking, there are many restaurants and gift shops. Caution: No Swimming at this beach. Katsura Beach is a great scenic beauty spot facing Pacific Ocean. This beach is considered as the best Luna view spot in Japan. 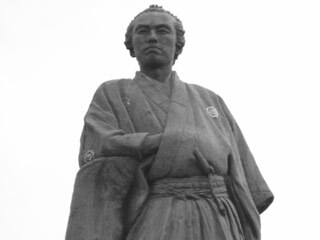 At the Cape Ryuzu has a statue of Sakamoto Ryoma.